In the spirit of Olympic record-breaking performances, here are some of Manitoba’s own world records. Bruce, the massive mosasaur fossil on display at Morden’s Canadian Fossil Discovery Centre holds the Guinness World Record in this category. At 13.05 m (42.815 ft), it took two years to excavate 80 million-year-old Bruce after he was discovered in 1974 in a farmer’s field. See Bruce, along with the other exhibits from Canada’s largest collect of marine reptile fossils, before heading out on a fossil dig adventure. Maybe you’ll discover the next record-breaking fossil. One hundred and thirty-nine antique threshing machines worked together to harvest a field at the Manitoba Threshermen’s Reunion and Stampede on July 31, 2016 — establishing a new Guinness World Record in the process. The event was held at Austin’s Manitoba Agricultural Museum — also home to the world’s largest tractor, called Big Roy — as a fundraiser and was successful thanks to more than 1,400 volunteers. In 2008, The Forks River Trail earned the Guinness World Record for its 8.54 kilometres of naturally frozen skating surface along the Assiniboine River. The trail returns every year featuring the beautiful and functional warming hut architecture installations. Trilobites are an extinct group of sea-dwelling animals with many legs that lived 445 million years ago. The world’s largest trilobite was found along the Hudson Bay in Northern Manitoba — measuring at more than 70 cm long (28 inches), which was 70% larger than the previous record holder. See a trilobite fossil at the Eskimo Museum in Churchill or visit the Earth History Gallery at the Manitoba Museum for more trilobites and other ancient fossils from Manitoba. Northern Manitoba’s Hudson Bay coastline is home to the world’s largest population of beluga whales. More than 57,000 beluga whales are found in the region. And every summer, the whales gather where the Churchill, Nelson, and Seal rivers flow into the bay to feed and give birth. Go on a whale watching adventure by boat or kayak – you can even paddle board or snorkel with these friendly and curious whales. Every spring, 75,000 red-sided garter snakes congregate in the limestone pits of the Narcisse Snake Dens for a massive mating ritual. The trails and viewing platforms offer easy access to watch these slithery animals. Warm, sunny days offer the best conditions for snake viewing. If you’re going to go big, you might as well be the biggest. And some of Manitoba’s roadside attractions have set the standard for size. 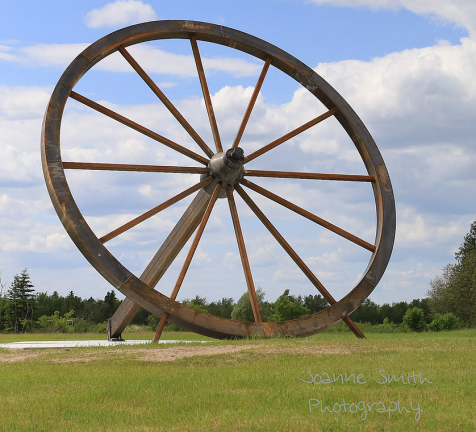 In Fisher Branch, which is proud to be the “hub” of the Interlake, you can see the world’s largest wagon wheel at 20 feet high, weighing 6,200 lbs. 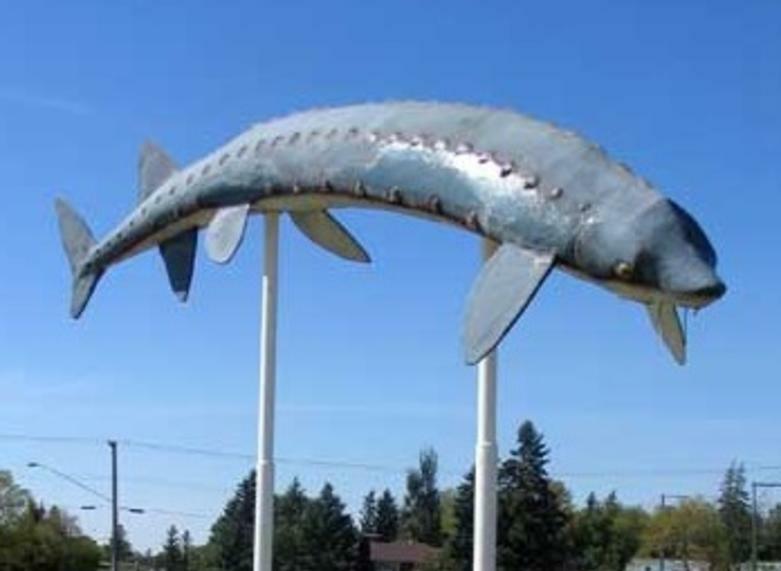 The sturgeon monument in Dominion City is a reproduction of Manitoba’s biggest sturgeon. Caught in 1903 in the Roseau River, the massive 150 year-old fish was a whopping 15 1/2 feet long and weighed 406 lbs. 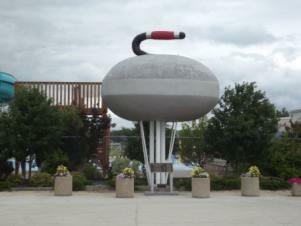 In Arborg, you can get your picture taken with the world’s largest curling rock, measuring 4.2 m (13.8 feet) across and 2.1 m (6.8 feet) tall, fitting because Manitoba is home to the Manitoba Open Bonspiel, which is one of the longest running annual sporting events in North America and one of the largest curling bonspiels in the world (the 1988 bonspiel had more than 1,200 teams!). 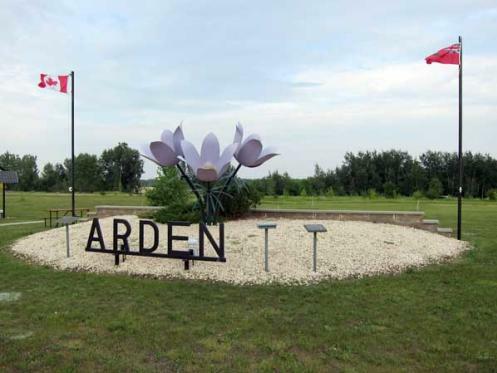 The world’s largest crocus monument is in Arden, where crocuses bloom on a native prairie grassland site every spring. 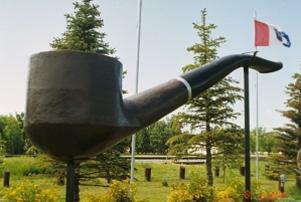 St. Claude is home to the word’s largest smoking pipe, built to recognize the French heritage of the settlers to this region. 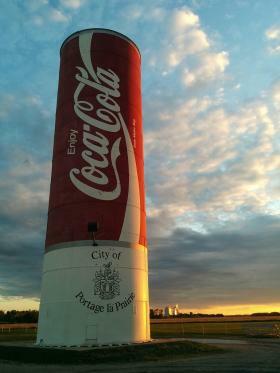 A former water tower was turned into the world’s largest Coca-Cola can, located in Portage la Prairie — but to really quench your thirst for fun, check out the city’s waterpark, Splash Island. Know of any other record-holding Manitoba attractions? Let us know in the comments below!